uKit is a slick and contemporary site builder that definitely gets the job done. While there are a few setbacks such as limited customization options, you will find everything you need to build a professional website. Launched in 2015, uKit is one of the newest kids on the block, but it’s already creating buzz in a good kind of way. What this site builder offers is a business-first WYSIWYG drag-and-drop interface that removes the fuss out of building a strong website. A quick look at the uKit website, and you get the impression that this is a serious website builder targeted primarily at small businesses that are looking to set up a professional website. uKit has a nice choice of widgets but not as large as what other builders, such as Wix, offers. Still, the available third-party integrations will pack functionality into any website. uKit offers a decent range of templates to choose from, all of which are mobile responsive. However, the strict responsive design tends to make it difficult to place page elements where you wish. 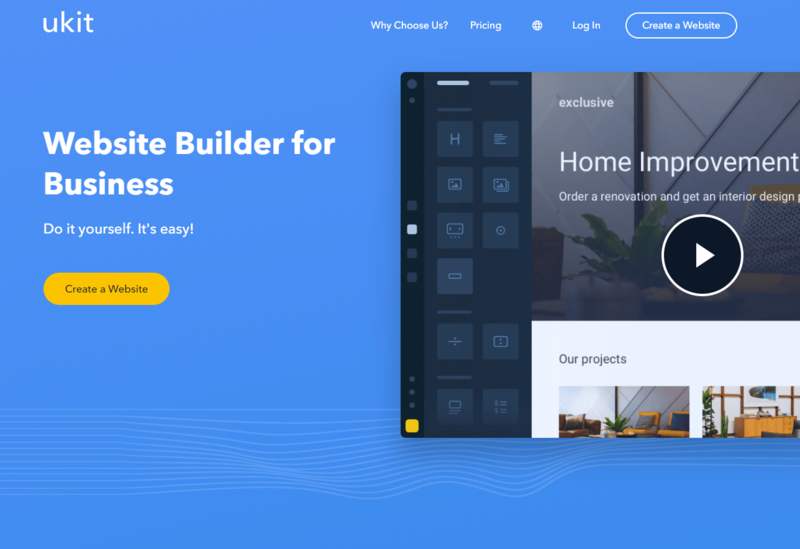 Nonetheless, this builder does offer some impressive features including a strong blogging platform, robust SEO tools, site analytics, and eCommerce integration. The intuitive drag and drop site editor makes it easy to perform an array of tasks—including desktop editing, maneuvering the image gallery, and creating blog posts. uKit supports multiple languages, so visitors can interact with your website in English, Polish, Russian, Portuguese, and Romanian. Like most site builders, uKit will not let you move your web pages to a different hosting service but all in all, this builder is evidently dedicated to providing great user experience. Great-Looking Templates but Limited Customization Options. Wide selection: There are over 200 themes at your disposal on uKit and while these are modern and professional looking, they all appear very similar. Even then, themes are neatly organized into business-specific categories, and you will find an impressive design in your niche. Mobile responsive: All uKit themes are designed to automatically fit any screen including smartphone and tablet. Unlike other popular site builders, uKit lacks a mobile editing view, so you cannot really change the appearance of your mobile site. Customization: While uKit has a lot of good things going for it, customization options are very limited when compared to other modern site builders. For example, there is no option for custom colors unless you upgrade to the Pro plan, and you cannot change basic things like font type or text size. Robust Features but a Few Hoops to Jump Through. eCommerce: uKit does not have its own eCommerce function but supports easy integration with Ecwid, a feature-packed eCommerce software. You can select your store layout from uKit but all other eCommerce functions—such as managing customers, inventory, and shipping methods—can only be conducted on Ecwid. There isn’t a simple PayPal widget—you would need to upgrade to the Pro account to be able to add a PayPal widget code. Blogging: uKit comes with a powerful blogging platform. Once the blog is added, you will be able to access some cool features including scheduling posts to be published later, adding the author’s name in posts, adding SEO settings, integrating social media buttons, adding videos and images to posts, and allowing comments via Disqus. All this put together make for a solid blogging function. Site statistics: While uKit flaunts robust marketing tools, it lacks inbuilt site statistics, so you’d have to integrate your website with Google Analytics. While Google Analytics offers comprehensive data, the reports are usually a day late while in-site stats are typically delivered almost in real time. uKit has a neat built-in wizard that shows you if your website has been properly optimized using the available SEO tools, something I haven’t seen in other site builders. Other nice features that uKit offers include live chat apps, MailChimp newsletters, SoundCloud integration, and SSL security. Efficient Tools That Simplify Site Building. uKit comes with an intuitive and clean site editor that makes all the features easily accessible. Features can be dragged and dropped on to the interface individually or they can be added as a group of theme-specific widgets. It’s good to see that uKit offers both approaches to website building—other site builders either let you add a group of elements all at once or add one element at a time. In addition to the standard undo/redo buttons, uKit offers the additional benefit of allowing you to back up your website, so you can restore it anytime without the risk of losing your content. While most site builders only allow you to preview your website on desktop and mobile devices, uKit lets you take a portrait and landscape view of your site across all devices. Facebook Page Converted to Website. Don’t want to spend time creating a website? uKit allows you to convert the content on your Facebook page into a complete website! All that’s needed is to provide a link to your Facebook page and uKit will auto-generate a website based on the available content after which you can edit your website as you see fit. Reliable Email Support but Few Communication Options. uKit lacks live chat and phone support, but their email system works quite efficiently. The support team replied to my email within a day, and my questions were satisfactorily addressed. There is a FAQ section that will get you up to speed with various aspects of the site builder, but unfortunately, uKit’s blog is not regularly updated. Pricing Plans that Offer Value for Money. uKit offers four types of accounts—the Premium, Premium Plus, eCommerce, and Pro. Before signing up, you can try any of one of these plans for 14 days free, after which you will be billed accordingly. The Premium plan is the entry-level tier and it gets you the basic features including a custom domain, unlimited disk space, pages and visitors, unlimited SMS notifications, unlimited domains, and access to 24/7 support. This plan also offers you powerful site statistics, mobile responsive websites, hosting, backup, and access to over 200 templates. Step up to the Premium Plus plan and you get everything included in the Premium Plus plan, plus premium themes, live chat support, and goals generated by Google Analytics. If you want to set up a digital storefront, the eCommerce plan is a good option. It enables easy integration with Ecwid and comes with all the features offered on the Premium Plus plan. The Pro plan gets you all the features of the eCommerce plan, plus additional customization options including access to custom code and custom color palettes. uKit is a slick and contemporary site builder that definitely gets the job done. While there are a few setbacks such as limited customization options, you will find everything you need to build a professional website. There aren’t too many integrations or built-in site statistics, but the powerful blogging platform, robust eCommerce function, good-looking mobile-responsive templates, and intuitive site editor all combine to make uKit a very reliable and affordable site builder for any business niche. Αναρωτιέστε πώς η uKit συγκρίνεται με άλλες εταιρίες Κατασκευής Ιστοτόπων; Εισάγετε οποιονδήποτε άλλον Κατασκευαστή Ιστοτόπων και εμείς θα σας παρουσιάσουμε τη σύγκριση πλάι πλάι.